The Mahalla workers will participate too , you may remember how they made their own day on the 6th April from couple of years ago. Another huge surprise or even change in this protest is its location in Cairo and Giza, it is no longer Down town or Nile corniche but rather at the famous Gamaat Al Doul street in Mohendessin , the heart of the middle class in Giza !! The other places are : Cairo university in Giza , Dawaran Shubra and Dawaran Al Mataria in Cairo. The NDP will participate too , of course in pro-regime protests of love …etc. May be this will be a showdown between the regime and the opposition , the real opposition in Egypt on who has got the word in the street. There are rumors that the MOI will launch its thugs to create chaos and violence , all what I know for sure is that the police will not enjoy their holiday because they will have to work. Personally I think the regime will let that day pass peacefully in order not to push the people in to another degree of anger , the world is now watching the Arab countries post-Tunisian revolution in an anticipation. The Egyptians in London are going to protest next Sunday January 23, 2011 at 1 PM in front of the Egyptian embassy in London , if you are there and interested in joining them then here is the Egyptian embassy address : 26 South Street, Westminster, London W1K 1DW. There will be also insh Allah a protest in Bologna , Italy. It will be held on the 23rd of January at 12 PM at Piazza del Nettuno. Also on Sunday there will be a protest held at 1 PM in front of the Egyptian mission to the UN HQ in New York at at 304 East 44th Street. Now it will not be the last capital in the world that will witness a protest in front of the Egyptian embassy or mission on that coming Sunday because there will be a protest in our embassy in Madrid at 1 PM too. Our great Tunisian brothers are going to protest in solidarity with the Egyptian people in front of the Egyptian embassy next January 25, 2011. Also our dear Jordanian brothers are going to protest inn front of the Egyptian embassy next January 25 ,2011. Our brothers in Yemen sent a solidarity email to the admin of “We are all Khaled Said” page. Just like El General in Tunisia the Egyptian rap singers and bands are making songs for the #Jan25 just like this one by rapper Ahmed Rock.There are lots of video clips on YouTube made by activists to encourage the people to participate in the protest of #Jan25. I'm very dubious about these ideas and sentiments of "Arab" revolutions and these revolts as fundamentally "Arab" phenomena. I think that events in Tunisia have far more in common with working class struggle in Britain, France, etc., than any "Arab" specficity and to keep banging on about "Arab" this and "Arab" that, tends to emphasise division rather than any communality of the class struggle. Egypt is obviously not Tunisia and the working class in Egypt, the only force in this country which has wrung concessions out of this regime, needs to be careful not to be drawn into exposing its forces on unfavourable grounds. Previously the working class here has known when to fight and when to withdraw. Next Tuesday's "revolution day", announced well in advance, while one can never say never, could well be unfavourable ground. The divisions in Egypt, not least of the religious type, are more powerful than Tunisia - as are the security forces. The latter would have already received - and will continue to recieve - the advice and help of the the security and intelligence forces of the USA and Britain at least. I doubt that the working class here are strong enough to take all these on at the moment. Tuesday's demonstrations will take the form of a nationwide set of anti-Mubarak protests, dubbed "revolution day" by opposition activists who hope that Tunisia's uprising will embolden the vast number of individuals like Shamad and persuade them that the time is right to make their voices heard. "In every neighbourhood in the country there is a pressure point which the government is afraid of and which will be brought to the surface on Tuesday," said Ahmed al-Gheity, 23, a doctor and one of the regional organisers of "revolution day". On the event's Facebook page, tens of thousands of supporters have posted comments suggesting Ben Ali's departure could be the precursor for Mubarak's downfall. "If Tunisia can do it, why can't we?" read one. "We will either start living or start dying on 25 January." Weary of the formal political arena, where even superficial opposition parties now find themselves blocked off from legitimate avenues of dissent (last November's blatantly rigged parliamentary ballot delivered a 93% majority to supporters of the ruling NDP), urban young Egyptians are instead carving out their own spaces in which alternative voices can be heard. If all 75,000 of those who have made an online promise to attend turn up on Tuesday, it will represent an organisational triumph. But such an outcome appears unlikely. "At the informal level – blogs, social media – there's been an explosion of political activity, entirely disconnected from the official mechanisms of government," said Amr Hamzawy, research director at the Carnegie Middle East Centre in Beirut. Yet this dynamism has largely failed to spill on to the street, where Mubarak's ubiquitous security apparatus still maintains near-total control. The only sector of society that has succeeded in physically occupying areas controlled by the state is Egypt's beleaguered workforce, which has confronted the regime over a range of economic grievances and succeeded in extracting concessions. "This is where the regime is most fearful," said Gamila Ismail, a dissident politician who unsuccessfully challenged the NDP in the recent elections. "They don't want the young, online activists with their political demands linking up and inspiring the labour force who are campaigning for a better standard of living. If youth in Cairo and Alexandria are connecting with Mahalla, then the government knows it is in trouble." Sixty miles north of the capital, the textile town of El Mahalla el-Kubra has been the militant spearhead of an unprecedented wave of strikes and sit-ins sweeping Egypt over the last five years. In April 2008 a walkout by factory workers led to three people being shot dead by police. The road to Mahalla passes through Cairo's urban hinterlands, which bleed messily into the Nile delta and surrounding desert – here the high walls of fast-proliferating gated communities for the rich look down on the redbrick clusters of ashwa'iyat, informal slum areas that are now home to 60% of the city's population. This is a clear window on to the hallmark of Mubarak's reign – a colossal appropriation of land and capital by the political and business elite. Young residents of the private compounds live in a parallel universe from their slum counterparts, but both share a basic detachment from campaigns for political change of the sort planned for Tuesday. "Of course, we are all excited about Tunisia; the people there threw off their shackles and I pray we could do the same," said Mahmoud Abdel Halim, 29, a construction worker. "But I don't see how we could repeat Tunisia here. I haven't heard about any protests, and even if I had it's not like I can afford to stop work and go and get arrested." Off Mahalla's main square, however, the picture was different. Last Friday a group of young people from across the delta was carefully preparing a series of Tunisian flags, pinning each to a short wooden pole. Others sketched out placards expressing Egypt's solidarity with Tunisia and condemning government corruption, police torture and poverty. When about 50 of them took to the streets in the late afternoon, handing out pamphlets advertising the protests on Tuesday, they were met with a bemused but generally positive response. I will wait to see what happens with this one. It looks like yet another rich kid internet fantasist's version of politics. 1125 GMT: Ahram Online says "at least 2000 protesters" heading from 26 July Street to Galaa Street in downtown Cairo. More than 1000 have reached Abdel Moneim Riyadh Square. The website also confirms Web chatter of the arrest of a number of activists at a Cilantro coffeeshop in Mohandessin, before they headed out for a protest. 1122 GMT: Tim Marshall of Britain's Sky News in Cairo reports, "Several hundred outside supreme court now. Peaceful." Another observer claims, "Protesters break cordon marching freely down street. Moving towards 26 July [Square]." 1105 GMT: More than 100 protesters have started a demonstration in front of the lawyers syndicate in Ramses Street in Cairo. 1100 GMT: An Ahram Online reporter in Alexandria denies earlier reports of protests in Moharram Bek, but says security presence is strong at Rassafa Square. Police have broken up the Dar el-Salam protest, south of Cairo. No one was detained. Police have moved against anti-government protesters in Assuit, according to a human rights lawyer Gamal Eid. Police are searching passengers at the underground metro stations of Matariya, Isaaf, and Tahrir in Cairo. There is a report that Nasser station is closed. Authorities have set up security cordons at entrances to the city of Mahalla, west of Cairo. 1030 GMT: From a reporter in Cairo: "Within seconds of filming, even with a stills camera, police stop us." 1020 GMT: 12:06 PM Security forces close down the headquarters of the El Ghad Party, headed by Ayman Nour, in Talaat Harb Square in Cairo. Security forces have set up barriers in the streets adjacent to the press syndicate, lawyers syndicate, and the attorney's building. Around 300 protesters are demonstrating south of Rafah, chanting against the Emergency Law and calling for the release of detainees. 1015 GMT: A protest has started in Moharram Bek, marching to el-Rasafa Street, in Alexandria. 1010 GMT: Tunisia's government has authorised $355 million for poor rural regions from where protests built against the Ben Ali regime. Regional Development Minister Ahmed Nejib Chebbi, a former opposition leader, announced the grant on a talk show late on Monday. He said the money would go towards public works projects, reimburse businesses that have suffered damage, and compensate the families of dozens of "martyrs" killed in the protests. 1004 GMT: From Twitter: "A policeman is roaming the halls of the Al Jazeera building in Cairo trying to find out names of people who will cover the Jan. 25 protest." 1000 GMT: There is chatter of "interesting things" happening in Quweisna in the Delta, with workers walking out and residents launching a civil disobedience campaign. Confirmation that Central Security Forces trucks and police vans are deployed in key locations, including in front of the Supreme Court, and in side streets. Sheikh Rihan Street, where the Ministry of Interior is located, is closed. There is also a large security presence in Mansoura, with police deploying armored vehicles around the stadium.Police are taking away the IDs of journalists in Mahalla. First reports have come in of protest, however, with "hundreds" demonstrating in in Dar El Salam, south of Cairo, chanting for "bread and freedom". A protest in front of Cairo University has been cancelled, with faculty instead participating in a demonstration in front of the Supreme Court. The US and Canadian embassies have asked their citizens in Cairo to avoid expected locations of protests. 0940 GMT: Both Egypt's Muslim Brotherhood and the National Association for Change, headed by Mohamed ElBaradei say that their members have been interrogated and threatened by security forces to prevent them from participating in today's protests. 0750 GMT: A useful article in Al Masry Al Youm explains the history of Police Day: it celebrates how Egyptian officers refused to surrender to British military forces in Ismailia on 25 January 1952, More than 40 were killed in the subsequent battle. It is the headline that is striking, however: "Egypt's Police --- From Liberators to Oppressors". 0745 GMT: First reports from Cairo, "Shobra metro station, Masara, surrounded by CSF [security force] trucks. Police on every street entrance in Garden City, also in front of Parliament." There are also reports of restrictions on mobile phone and Internet service. Another activist says simply, "Streets are empty. Police are everywhere." One observer counted 33 riot trucks and vans in Tahair Square. Streets around the Ministry of Interior are closed. 0710 GMT: We will be watching developments in Egypt, where protesters --- how many? --- will turn out for "a day of revolution" over torture, poverty, and unemployment. Demands include the firing of the Minister of Interior, the cancelling of the perpetual State of Emergency that suspends civil liberties, and a term limit on the Presidency to end the 30-year rule of Hosni Mubarak. State security officials have said the protests are illegal will be dealt with "strictly". •	There is a presence in security forces in the major squares. •	The first anti-regime protest has allegedly started unexpectedly from populated Dar Salam area , people are chanting " Long live Egypt " ,"freedom and bread is all what Egyptian wants"
•	There is a news that a pro-regime protest is roaming Alexandria. •	There is a protest led by teachers allegedly in Sharkia governorate. •	There is a huge security presence in Down town Mansoura. •	The Mahalla entrance and exist are being locked down by heavy security forces. •	The security at Mahalla is taking the IDs of journalists. •	Ayman Nour is heading a protest at Bab Al-Sharia according to his twitter account. •	You can also follow the updates at "We are all Khaled Said group" and "RNN"
•	There are alleged protests in Asuit and Al Arish. •	8 girl activists among them a journalist in Islam Online was arrested from Cilantro Gamat Al Doul. •	According to El Badil twitter account the protest in Qena has started. •	According to Al masry Al youm the protest in North Sinai has started. •	According to eye witnesses in Alexandria huge number of people stayed at the mosques to start protesting "supposedly now"
•	Hamdeen Sabhi is heading a protest in Kaft Al Sheikh. •	Al Masry Al Youm is broadcasting a live stream from down town. •	The entrance and exists of Cairo are being locked. Someone on twitter just said "10,000 in Mahalla", also that a police cordon was broken and the police were surrounded by protesters (which is apparently a first). Remarkable scenes in Cairo as thousands and thousands are marching with apparent freedom on the streets after years of seeing every anti-government protest immediately shut down by police. Riot troops are following close behind but seem uncertain as to what to do - three major demonstrations are now ongoing in different parts of the Egyptian capital, all of whom have broken through police cordons, but there seems to be little coordination between protest leaders about what to do next. I'm downtown outside the offices of the government newspapers where hundreds are chanting 'Mubarak, your plane is waiting' and appealing for passers-by to join them, many of whom are taking up the offer. Ahmed Ashraf, a 26 year old bank analyst, told me this was his first protest, and that he had been inspired by events in Tunisia. "We are the ones controlling the streets today, not the regime," he said. "I feel so free - things can't stay the same after this." In Cairo between 20,000 and 30,000 cops have been deployed. According to the cops, 15,000 demonstrators have gathered. Outside Cairo, there have been demos as well, most notably in Alexandria, in Assouan and Assiout, in several towns in the Nile Delta and in Ismaïliya on the Suez canal. And in the North of the Sinai peninsula, hundreds of people have cut a road between el-Arich and Rafah, near the Gaza strip border, using burning tyres. Sources: Le Monde and Midi-Libre. Twitter again, says water cannons were used in central Cairo. Also that twitter itself has been blocked in Egypt today, a few people there are managing to send stuff out via internet proxies. This is what annoys me when people talk about protest via twitter or facebook being 'decentralised' when it's exactly the opposite. Most people in Egypt don't even have Twitter or Facebook. Still good that so many people are out. Especially interesting about Mahalla. There's loads in the Al Ahram stream, but I've just taken the last hour reported, for brevity's sake. 4:03 PM Tear gas is fired at protesters in Tahrir Square. 4:06 PM Thousands of protesters move from Abdeen Square heading to parliament, chanting "We want a free government." 4:13 PM Thousands of ordinary citizens join anti-government protesters in Mahalla. They are chanting, calling for a revolution in the Shawn Square. In Cairo's Tahrir Square, protesters have attacked a police armored vehichle that was firing tear gas canisters, says Ahram Online reporter. Another reporter confirms more clashes taking place in Sayyeda Zeinab. 4:19 PM More protests in Mahalla break out in Mahgoub Square. Some factory workers from Ghazl el-Mahalla join the protest. In Shubra, prominent leftist Mohamed Waked has been detained. In Tahrir Square, more than 20 protesters arrested. 4:20 PM An Ahram Online reporter describes the area in front of the Mogamaa Tahrir as a "war zone" with protesters throwing rocks at the police, amid water cannons and tear gas. 4:31 PM Protesters topple and roll over a police kiosk in Qasr El Aini Street. Stone throwing battles continue. 4:41 PM Twitter service is down in Egypt. 4:55 PM Clashes continue around the parliament, says Ahram Online reporter. 5:06 PM Violence has stopped for now, according to Ahram Online reporter in Tahrir Square. In Alexandria, protesters have exceeded 20,000 today. 5:18 PM A new round of arrests by the police in the parliament area in downtown Cairo. Protesters are throwing rocks. 5:25 PM Several protesters have been injured in the Tahrir clashes, as demonstrators try to storm the parliament, says Ahram Online reporter. Central Cairo was the scene of violent clashes tonight, as the biggest anti-government demonstrations in a generation swept across Egypt, bringing tens of thousands onto the streets. Shouting "down with the regime" and "Mubarak, your plane is waiting," protesters demanded the end of President Hosni Mubarak's 30-year dictatorship and said they were fighting back against decades of poverty, oppression and police torture. The protests had been declared illegal by the authorities and were met with a fierce police response, as tear gas and water cannon were fired into the crowd and rocks were hurled into the air by both demonstrators and security forces. "We have never seen anything like this before – it is the first day of the Egyptian revolution," said Karim Rizk, one of those who joined multiple rallies in the capital. Apparently taken by surprise at the size of protests, police initially stood back and allowed demonstrators to occupy public squares and march through the streets, an unprecedented move in a country where political gatherings are strictly outlawed and demonstrations are normally quickly shut down by security forces. "We have taken back our streets today from the regime and they won't recover from the blow," claimed Rizk. Elsewhere protests broke out in the Mediterranean port city of Alexandria, where marchers tore down posters of Mubarak and his son Gamal, whom many believed is being groomed for the presidency. Roads were also blocked by demonstrators in the Sinai Peninsula, and large rallies were reported across the Nile Delta and the Suez Canal region. Analysts declared it to be the largest anti-government uprising since 1977, when riots over rising bread prices brought the army on to the streets. Today's protests were called by a coalition of online activists, who had declared 25 January a "day of revolt" against the ruling elite and encouraged Egyptians to follow in the footsteps of Tunisia, where mass demonstrations forced President Ben Ali to flee earlier this month. As evening fell thousands of protesters from separate demonstrations converged on Tahrir Square, Cairo's central plaza, and begun an occupation that continued into the night. Demonstrators waved Egyptian and Tunisian flags, hauled down a billboard for the ruling NDP party and chanted "depart Mubarak" at the 82-year-old leader, who will face presidential elections later this year. Breakaway groups attempting to reach the Egyptian parliament building fought running battles with armed police, whose cordons were broken several times. Any suggestion that the protests were being quietly tolerated by the widely-despised security apparatus quickly evaporated, as police sent tear gas canisters into the crowd and released sound-bombs in an attempt to disperse protesters. There were several injuries, with many demonstrators seen with blood pouring down their faces. The clashes came on a public holiday dedicated to saluting the achievements of the police force. What's interesting about this is that the Ikhwan (Muslim Brotherhood) announced before today that while they (grudgingly) had decided to support the stated aims of the demonstration, they weren't going to mobilise their supporters for it. Given that they've been up until now, seen as the biggest beast in the jungle in terms of getting numbers out on the streets, to allow a 20,000 (?) strong confrontational demo, openly against the regime like this, to go ahead without them being seen as a major mover or power within it, is major tactical blunder on their part. Which may allow the movement momentum to grow outside of their sinister grip. They did the same thing around the time of Mahalla/ 6th April protests a few years back. The Ikhwan are basically like your garden variety Trot/Leninist group (in fact, in terms of organizational structure etc. the Ikhwan are a Lenist party). If they can't control the movement they won't work closely with it. Tens of thousands of Egyptians took to the streets today demanding the end of President Hosni Mubarak's 30-year rule in mass demonstrations inspired by the toppling of the government in Tunisia. The capital, Cairo, was the scene of violent clashes as thousands of protesters from separate demonstrations converged on Tahrir Square, the central plaza. Demostrators waved Egyptian and Tunisian flags, hauled down a billboard for the ruling NDP party and chanted "depart Mubarak" at the 82-year-old leader, who will face elections later this year. One policeman died in the Cairo violence. Two Egyptian civilians and a police officer have died after a wave of unusually large anti-government demonstrations swept across the country. The two civilians died in the eastern city of Suez, according an interior ministry offical. One, who had respiratory problems, died after inhaling tear gas; the other died after being hit with a rock thrown during a protest, the official said. Meanwhile, in Cairo, a police officer died after being hit in the head with a rock during the capital's biggest protest in Tahrir Square in the city centre, the official said. Some protesters in downtown Cairo hurled rocks and climbed atop an armoured police truck. Police responded to the demonstrators blasts from a water cannon, and set upon crowds with batons and acrid clouds of tear gas to clear them crying out "Down with Mubarak'' and demanding an end to the country's grinding poverty. Well, who would have believed it? Today's protests in Egypt far exceeded my own expectations and, no doubt, the expectations of the organisers and the Egyptian authorities. The Mubarak regime, even if it's not headed for oblivion just yet, must surely be shaken to the core. For blow-by-blow accounts of the events as they unfolded, see AhramOnline, Enduring America and the Guardian. I wrote this morning that today would be the first real test of the "Tunisia effect" – and we can now safely assume that it does exist. Without Tunisia, the protests in Egypt would have had nothing like the support they got. Today, someone coined the word "Tunisami" (Tunis + tsunami) and there were chants of "Ya Mubarak, Ya Mubarak, al-Saudia fi intizaarak" – Mubarak, Mubarak, Saudi Arabia (the retirement home for ex-dictators) is waiting for you. I also suggested this morning that today would be a test of the "new" Arab politics (largely informal and organised online) against the old, institutional, opposition politics. Case proven. The new politics has shown itself to be viable. Maybe I should add, too, that it was a test of the new media versus the old media. Again, case proven. The old media – even al-Jazeera – looked slow on their feet and too preoccupied with the less important game of musical chairs in Lebanon. As for the new media, this morning, Wael Abbas, the most famous Egyptian blogger, was out and about in Cairo, with a live webcam mounted in a car. The independent newspaper, al-Masry al-Youm, was also streaming live video from the streets. Twitter (hashtag #jan25) went into overdrive. Citizen journalists were everywhere – someone counted seven of them recording the scene on their mobile phones at just one location during a single 21-second film clip. Late this afternoon there were signs that some kind of internet crackdown had begun, with reports that Twitter had been blocked. At present, though, it's not entirely clear what is going in that area. The protests themselves started off peacefully, though the tear gas, plastic bullets (and possibly live bullets too) came later. The security forces were out in strength and thought they had planned well. But in Cairo they were wrong-footed by the protesters who had announced their own plans but then changed them at the last minute. By staging multiple demonstrations in different places they also seem to have kept the security forces on the hop. In fact, for much of the day the security forces don't seem to have behaved with quite the gusto that Mubarak might have expected of them. There were reports of demonstrators being allowed through police lines in some cases, and of demonstrators fraternising with the police. One woman was photographed giving them roses. At present, no one can say with any certainty where all this will lead. But I suspect today's events will leave the protesters feeling emboldened rather than intimidated. 5:45 PM Concerted wave after wave of tear gas fired at and into protesters on Tahrir Square as Central Security in riot gear charge them away from Parliament. 6:00 PM Crowds regroup to maintain occupation of Tahrir Square as a heavy presence of Central Security Forces cordon off Qasr El-Aini Street. 7:10 PM Central Security Forces ring protesters outside the High Court on Ramses Street. 7:46 PM Police fire tear gas at protesters in Sidi Gaber, Alexandria. 8:05 PM An uneasy calm prevails in Tahrir Square as both security forces and tens of thousands of protesters hold their positions. Ahram Online reporter says that protesters are now sitting down in the square discussing whether or not to continue the protest through the night. 9:30 PM According to medical sources, two protesters are dead in Suez, and according to Police sources one Central Security Forces soldier is dead in clashes in Cairo. 9: 35 PM Clashes between Police and protesters in Alexandria. Corniche Road opened. 2118 GMT: Tim Marshall of Britain's Sky TV reports, "Just back from [Tahrir] square. Saw 100 young thugs in plainclothes with truncheons behind police lines. They were with the police." 2115 GMT: A report says 4000 people are coming from Giza to join the crowd in Tahrir Square in Cairo. 2050 GMT: A claim is circulating that 7000 protesters are having a sit-in at Misr Station in Alexandria tonight. 2045 GMT: Ahram Online is reporting clashes tonight between police and protesters in Alexandria (see video in separate entry). 2025 GMT: The website of Egypt's Ministry of Foreign Affairs has been knocked off-line. Earlier today the Minister of Interior website was taken down (see 1610 GMT). The website of the ruling National Democratic Party also appears to have been limited by attack. 1959 GMT: State TV is reporting one police officer killed in central Cairo. 1955 GMT: Journalist Mohamed Abdelfattah has been detained and beaten. He reported the experience via Twitter. 1953 GMT: Protesters have dispersed from the demonstration outside the Supreme Court. This leaves the mass protest in Tahrir Square as the focus of attention tonight. 1951 GMT: News services are reporting two people killed during protests in the Suez district in northeastern Cairo. 1948 GMT: Ben Wedeman of CNN reports with concern, "Huge number of riot police deploying next to Egyptian museum, troop trucks moving in." 1935 GMT: A participant reports, "All telecommunications down in Tahrir Square. We can't call, update Twitter. I went out to update you and get updates." There were continuing clashes, with arrests and injuries, near Parliament and in Tahrir Square as protesters threw rocks and police charged and fired tear gas. Protesters have maintained their occupation of Tahrir Square as security forces cordon them off. Forces have also put a ring around outside the High Court on Ramses Street. In Alexandria, police fired tear gas at protesters in Sidi Gaber, Alexandria. 1915 GMT: Returning from an academic break, I find that Al Jazeera is reporting the Egypt Minister of Interior is blaming the Muslim Brotherhood for today's protests. 1700 GMT: Reports escalating of clashes in Tahrir Square in Cairo between police and protesters. We will be back in two hours, after an academic break, to bring you the latest developments. 1635 GMT: There is a report of a journalist being hit with a rubber bullet in Alexandria. 1630 GMT: Ben Wedeman of CNN writes, "Large groups of plainclothed cops headed to heart of Tahrir [Square]." This afternoon, there were clashes and arrests in Sayyeda Zeinab, Shubra, and Tahrir Square in Cairo, with protesters attacking a police armoured vehichle that was firing tear gas canisters. More protests broke out in Mahalla broke out, with factory workers joining in. The area in front of the Mogamaa Tahrir was described as a "war zone" with protesters throwing rocks at the police, amidst water cannons and tear gas. Protesters toppled and rolled over a police kiosk in Qasr El Aini Street, and clashes continued around the Parliament. 1610 GMT: The Anonymous collective has knocked the website of Egypt's Ministry of Interior off-line. 1550 GMT: CNN's Ben Wedeman writes, "Thousands in tahrir singing national anthem....No police in sight." 1545 GMT: Tim Marshall of Britain's Sky TV in Cairo: "Another 1000 protestors just turned up. It's dusk." Protesters are moving towards Parliament. One report says 32 people arrested on Qasr-Eini St, 5 in Tahrir Square, 8 in Tera’a Boulaqia in Shubra, 7 in Port Said, 9 in Mansoura. 1530 GMT: A claim from an activist in Cairo: "We are in Tahrir [Square]. At least 7 thousand. Tahrir is ours." 1520 GMT: Back from an academic break to find that Al Jazeera are estimating 20,000 protesters in Alexandria. There are reports that demonstrators on Cairo's Tahrir (Liberation Avenue) protesters are said to plan on spending the night. Reports are growing that Egyptian authorities are shutting down Internet services, including Twitter. There is disruption of cell phone service. In a quick test of both claims, Ben Wedeman of CNN reports --- via Twitter --- "Walking toward Parliament. Can't call out." 1350 GMT: Protests are swelling near 26 July Street in downtown Cairo. Police tried to use water cannon; at least has been destroyed by protesters. 1345 GMT: Security forces are moving to protect the Ministry of Interior, as protestors move throughout the city. At least 12 armored vehicles were moving to the area. Marches are growing in the Shubra section of Cairo. In Mansoura, demonstrators are marching on State Security Police headquarters. In Giza, thousands are now marching from Dokki to Tahrir Square. Thousands in Ataba are chanting against the interior minister and the president. There are now protests have broken out in Aswan. Police have sent in armored vehicles, but there are no clashes yet. In Mansoura, protesters have marched on the town's security directorate building. Marchers in downtown Cairo have gone through Wekalet El Balah area. Clashes are taking place between protesters and the Central Security Forces near the High Court. Ramses street has been completely shut down by the police. A protest has started in Meit Uqba, Giza. In Mahalla, a protest march is heading to the Shawn Square. Sinai protesters have shut down the road to the airport used by the Multinational Force Observers. As midnight approaches in Cairo thousands of protesters are still occupying the Tahrir Square, vowing to remain in place until the government falls. News has reached Egyptians here of deaths in Suez and the capital, as well as unconfirmed reports that Gamal Mubarak – the president's wildly unpopular son and presumed heir apparent – has fled to London, and they appear more determined than ever to hold their ground. "We will stay here all night, all week if necessary," said Youssef Hisham, a 25 year old filmmaker. "There are too many people on the streets for the police to charge – if they did, it would be a massacre. I came here today not as the representative of any political party, but simply in the name of Egypt. We have liberated the heart of the country, and Mubarak now knows that his people want him gone." As fresh waves of protesters broke through police cordons to join the throng in Tahrir, a festival atmosphere took hold – groups were cheered as they arrived carrying blankets and food, and demonstrators pooled money together to buy water and other supplies. "The atmosphere is simply amazing – everyone is so friendly, there's no anger, no harassment, just solidarity and remarkable energy," added Hisham. Drums were banged and fires started as night moved in; having established their lines, hundreds of security forces stayed put and kept their distance, although alarmingly police snipers were seen to be taking up position on nearby buildings. "They are waiting for numbers to dwindle, and then they will switch off the street lights and charge," warned Ahmed Salah, a veteran activist. "We must hold Tahrir through the night and tomorrow, so that every corner of Egypt can take us as an inspiration and rise up in revolt," claimed Salah. "It's a matter of life and death now – what happens over the next 24 hours will be vital to the history of this country. It's a very emotional moment for me." Pamphlets widely distributed amongst protesters declared that 'the spark of intifada' had been launched in Egypt. "We have started an uprising with the will of the people, the people who have suffered for thirty years under oppression, injustice and poverty," read the Arabic-language texts. "Egyptians have proven today that they are capable of taking freedom by force and destroying despotism." 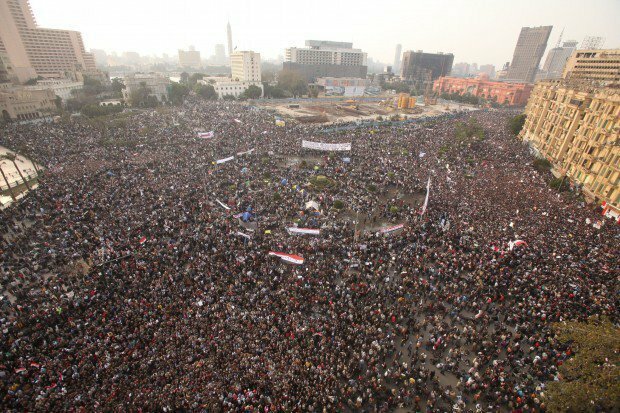 They went on to call for the immediate removal of President Mubarak and his government, and urged Egyptians nationwide to begin a wave of strikes, sit-ins and demonstrations across the country until these demands were met. "Long live the struggle of the Egyptian people," the pamphlets ended. Shame in your face, Khawaga! The class struggle surprises revolutionaries once again! The opinion of an Egyptian on that thread: "If it gets nasty, it will get nasty for Mubarak - the police and army will side with the people." Wow when I was staying in Cairo a few months ago I was in a hostel on the very street where this is being filmed, so that is pretty weird to watch. Cairo university is very close by so I'm guessing many of these demonstrators will be students. So I was checking the TV news at around midnight (GMT) last night and Sky had some confusingly mixed recent and live feed footage of the final assault by the cops to clear Tahrir square. Looks like it was all over (in Tahrir) by about quarter past, that would have been 02:15 Cairo time. The regime's reaction is predictably to ban all demonstrations and gatherings (BBC). Naturally Mubarak is also trying to blame the Muslim Brotherhood, even though they weren't there. Presumably mainly for US and EU consumption. When Donald Rumsfeld is dead and forgotten, people will still be using his known unknowns and unknown unknowns distinction. Such a wonderful phrase from such an abysmal human being. truncated for the sake of the thread, but the whole thing is defo worth a read imo. A third Egyptian protester, wounded during clashes with security forces on Tuesday in a nationwide 'day of anger', died in hospital on Wednesday as a result of his wounds, medical sources said. Cairo Health Director Nibal Abdel Kader stated that 90 people were injured in Cairo proper during Tuesday's protest, adding to a combined total of 124 injured in both Cairo and neighbouring Giza governorate. Egypt's interior ministry has warned that it will crack down on anti-government protesters if they take to the streets a day after massive and deadly demonstrations across the country called for an end to Hosni Mubarak's three-decade rule. Thousands of armoured police deployed at key locations around Cairo, the capital, on Wednesday in anticipation of renewed demonstrations, which some have called the most significant in Egypt since massive riots over the price of bread in the 1970s. Three protesters died in the port city of Suez, east of Cairo, during Tuesday's unrest, and a policeman was also killed when he was hit in the head with a rock in Cairo, an interior ministry official said. Al Jazeera's Rawya Rageh, reporting from the Egyptian capital on Wednesday, said that the interior ministry had issued a statement banning further protests and threatening anyone encouraging them with investigation. More protests were still apparently being planned, though the streets of Cairo remained "absolutely quiet" as of midday Wednesday, Rageh reported. Violent clashes between police and protesters that began on Tuesday evening lasted into early Wednesday morning, as security services sought to disperse a crowd of thousands that had planned to sleep in Tahrir (Liberation) Square in central Cairo. 1255 GMT: Reports of small protests at the lawyers' and press syndicates in central Cairo, with up to 400 demonstrators. 1230 GMT: Ben Wedeman of CNN reports, "Plainclothed police snooping around outside Cairo University bothering students talking to press. Plainclothed policemen tells me its forbidden to sit in front of Cairo university." 1225 GMT: Scattered protests now being reported but they are failing --- so far to take hold. Measures include, "Dokki and Ramsees protest fizzled, I hear of plans for a protest at the lawyer's syndicate" and "Young man injured in Hosary Square with reports of protestors passing out". Other activists report confusion over which protests are "real" and which are diversions. Movement is restricted by checkpoints. 1155 GMT: In Mansoura, security forces have cracked down on a protest as it started, arresting 10 people.